Moussa Traore invites you to Bamako, Mali, to study drum and dance. You will live in the village of Fadjiguila, just 1 mile outside the capital city of Bamako. You will have time to explore Bamako, to visit the colorful street markets, to participate in traditional ceremonies and you will get to experience, first-hand, the traditional context of the rhythms and dances. 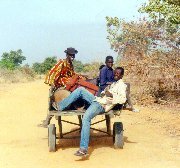 Moussa will teach the drum classes and former members of the National Ballet of Mali will teach the dance classes. If you are interested on learning other instruments or crafts, Moussa can arrange classes for you. Your stay will include an overnight excursion into the bush to visit the villages. There you will experience the customs of village life and meet some of the most knowledgeable djembe drummers and dancers in the country. We will also spend a few days visiting the Dogon country, to experience their unique ceremonies and mask dances. The trip duration is 3 weeks, August 8 – 29, 2009. If you want to go for a shorter time or stay longer, please talk to Moussa about it. You will arrange your flight to Mali. Air France and Air Morocco have flights to Bamako. You will need a valid passport and a visa. For the visa application, contact the Embassy of Mali (www.maliembassy.us, 202-332-2249). A deposit of $500 should be paid by May 1 to confirm the reservation. The balance should be paid by June 15. Minors must show proof of parental authorization. After completing the registration, we will send you background information about Mali and a list of things you should bring.